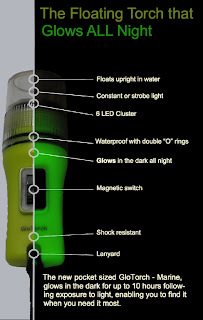 DualGlo has launched a new ‘glow in the dark’ torch specifically for the marine market. In addition to its body glowing in the dark, the GloTorch Marine floats upright allowing the beam to be highly visible in water. Having a good pocket torch that floats is a ‘must’ for any sea trip. The new GloTorch Marine is fitted with a six LED light cluster for outstanding brightness and comes with a 60 flashes/min strobe light for emergency situations which makes it the perfect hand torch for any serious sailor. Because it is a LED torch if one bulb fails the other five will continue to work which means you won’t have to carry a spare bulb. Because it glows in the dark you can always find it when you need it without destroying your night vision. Fitted with a double ‘o’ ring and a magnetic switch the torch is fully waterproof regardless of conditions and its shock resistant body means it will be able to take the knocks of a rough passage. A handy adjustable lanyard makes it easy to carry and enables it to be hung round your neck freeing up both hands. Its unique patented ‘glow in the dark’ technology enables it to glow all night with just fifteen minutes exposure to bright light each day.